The Chestnut Teal duck is darker and a slightly bigger bird than the Grey Teal. In flight, the wedge-shaped white patch on both the upperwing and underwing is obvious. The male Chestnut Teal has a white patch on the flank which can also be seen in flight. The male is a dark bird with a very dark glossy-green head.On the water, the Chestnut Teal is a small, dark duck which floats high. The male has a glossy-green head and a white flank patch. The female and juvenile male are similar to the drab Grey Teal, but are darker and lack the white throat. Most common in brackish coastal lagoons, saltwater estuaries and the lower reaches of creeks around the coast, the Chestnut Teal is distributed in south-eastern and south-western Australia. Vagrants may occur elsewhere. Tasmania and southern Victoria are the species' stronghold. Hello, the Chestnut teal duck is beautiful. Nice view of the ducks and pond. As always, I appreciate your joining in with my 200th Critter party. Thank you for linking up and sharing your post. Happy Saturday, enjoy your weekend! Such a pretty, peaceful scene! Nice pic of the Chestnut teal ducks. Great reflections too. Such an idyllic scene! 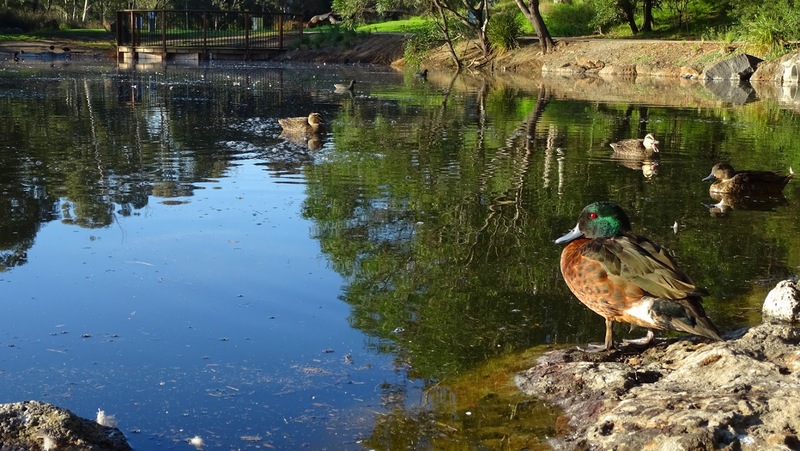 Love your beautiful duckpond! Beautiful! Your photo really captures the beautiful colours in the duck and the wonderful feather detail. Again thanks for linking up.